In celebrating the 55th anniversary of Kyoto Computer Gakuin and the 15th anniversary of The Kyoto College of Graduate Studies for Informatics, we would like to express our deep feelings of gratitude to the Ambassadors from each country concerned, and the distinguished guests from the business and academic communities who have joined us here today. 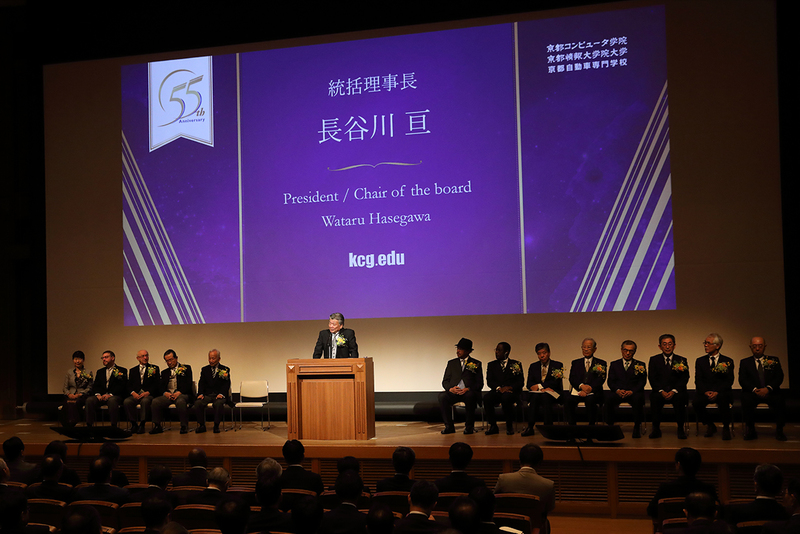 This year, our Kyoto Computer Gakuin is celebrating its 55th anniversary. 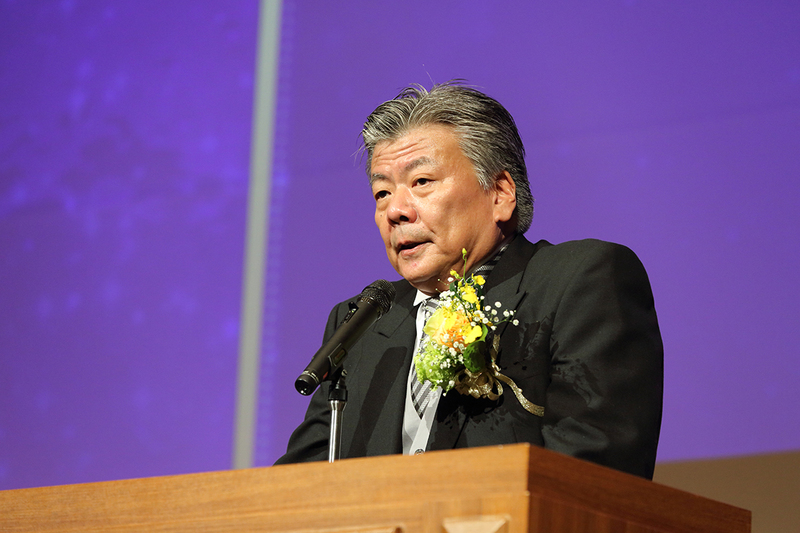 Further, The Kyoto College of Graduate Studies for Informatics is celebrating its 15th anniversary since its inauguration and approval by the regulatory agency in 2003. All the faculty members are extremely happy to celebrate this anniversary with so many alumni, school supporters, and students, who are watching the ceremony via live streaming. Currently, the KCG Group is comprised of a series of locations and organizations including the Rakuhoku Campus, Kamogawa Campus, and Kyoto-Ekimae Campus of Kyoto Computer Gakuin, the Kyoto Japanese Language Training Center, Kyoto Computer Gakuin Automobile School, main Kyoto Campus, the Sapporo and Tokyo Satellite sites of The Kyoto College of Graduate Studies for Informatics, and some corporations that the support the education business such as KCG Career. Today, I would like to outline our future perspectives while looking back at some milestones in our history. The root of Kyoto Computer Gakuin was a private school started by Mr. Shigeo Hasegawa, the first president, and Mrs. Yasuko Hasegawa, the current president of KCG. They were graduate students at Kyoto University. While it started as a small private school for junior high and high school students that the young couple ran at home, in 1963 a workshop called “FORTRAN Workshop” was inaugurated and centered on young researchers from Kyoto University. Computers were only being studied by a small number of researchers at that time and the workshop become more widely known to researchers and corporate people in the Kinki Area day by day. 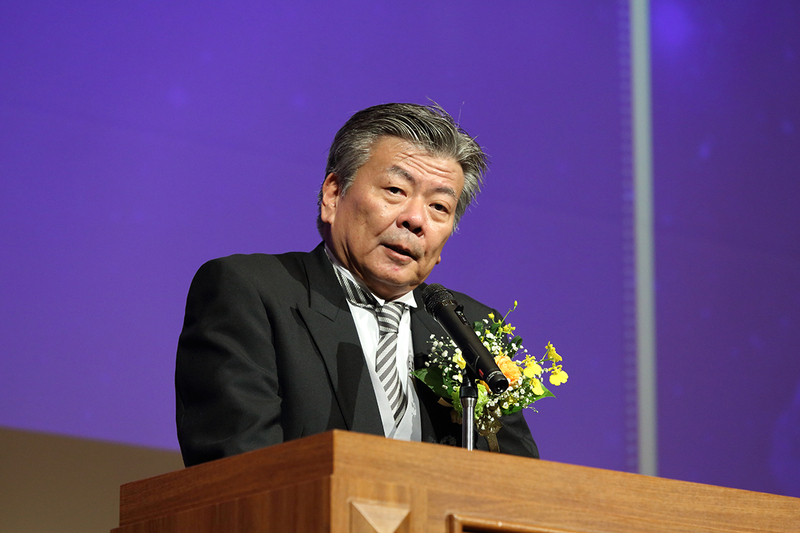 In 1969, a full-time course was started for high school graduates under the name “Kyoto Computer Gakuin.” The founder and first president, Shigeo Hasegawa, left us the words, “Software is a way of thinking. It is a kind of philosophy and it has the power to transform human history.” Since the foundation of KCG, he has always placed emphasis on the academic aspect of software technology under the motto of “fostering creative information technology engineers contributing to contemporary society.” Instead of just teaching simple knowledge or skills, he practiced full-scale computer education supported by theory. This education slogan has been passed down over time without change and has formed the foundation of KCG’s education philosophy. As time goes by, it has become an urgent need for the domestic industry to develop professionals who can work in the international arena with sophisticated IT expertise and maintain pace with the drastic progress of science and technology reformation and the socio-economic situation. The Kyoto College of Graduate Studies for Informatics was founded 15 years ago as the first domestic college that issues a terminal degree for IT professionals. Since its foundation, we have promoted collaborations with various overseas institutions looking to become professional IT schools for students from all over Asia. At the moment, we have over ninety overseas partner colleges and universities. In recent years, we have seen a gradual increase in overseas students who come from countries and regions with no specific connection to us. These students tend to find us via an Internet search and decide to join us after thoroughly studying our curriculum and mission. This means that the age has come when students choose their schools solely by the information they get on the Internet, and our student recruiting system has started to work globally. In 2013, a traditional school for educating automobile mechanics was acquired by the KCG Group and became a member as Kyoto Computer Gakuin Automobile School. This was a part of our strategy predicting a stronger connection between automobiles and IT in the future and the increasing importance of car mechanics with IT expertise. Now, the country is heading towards the commercialization of autonomous cars. We are working hard so that we can contribute to the further development of the automobile industry. In addition to Kyoto University, the university with the longest relationship with KCG, our group maintains strong ties with more than 130 overseas universities and educational institutions including the Massachusetts Institute of Technology (MIT), Harvard University, the Rochester Institute of Technology (RIT), and Columbia University in the US, Dalian University of Foreign Languages and Shanghai Jian Qiao University in China. In addition to computer technology, we are pursuing the essence of information technology and engineering education in the broader scope of science with the support of these partners. We are actively approaching the renovation of our curriculum by focusing on the realization of student-centered education. Along with exchanges with overseas educational institutions, we are promoting our International Development of Computer Education (IDCE). This activity was started roughly 30 years ago in 1989 when we donated PCs to Thailand and provided technical training. In 2007, we entered into a treaty with Eritrea regarding support for computer education, and we donated PCs to the Continuous Education Agency of the Ministry of Education in Eritrea. This year, we donated 144 PCs to the Gabonese Republic. We have provided technical support and donated PCs to as many as 25 countries. Thanks to strong partnerships via overseas computer education support activities, it is great honor and pleasure for us to welcome the Ambassador of Eritrea, Your Excellency, and the Ambassador of Gabonese Republic, Your Excellency, to this ceremony. Further, over the last 30 years, KCG has accepted many trainees at the request of the Japan International Cooperation Agency (JICA) and has dispatched tutors to other countries as part of JICA’s professional team. In the Republic of Mozambique, the KCG Group was involved in the foundation of a higher education institution for information engineering education. We feel it is our mission to contribute to the development of IT education globally together with our overseas stakeholders. It is our hope to continue our journey with our international friends and partners so that we can be a global educational institution now and in the future. We, the KCG Group, would like to express our heartfelt thanks to all the supporters and stakeholders over this long 55-year period. We believe that we can contribute to the next generation by demonstrating KCG’s foresight and spirit of taking on challenges that have been inherited by more than 40,000 KCG family members including its students, alumni, faculty members and others. It is the pioneer spirit and DNA of KCG that created the first domestic institution dedicated to computer education and the first domestic graduate school dedicated to IT. We are determined to continue facing new challenges to respond to society’s expectations by making the best use of our experience. To conclude my speech, I would like to once again thank everyone in attendance at today’s ceremony and wholeheartedly ask for your continued support and cooperation. The KCG faculty team looks forward to receiving your guidance and encouragement. Thank you again for taking the time out of your busy schedule to attend this special event.